My absolute favorite time of year! Is it anyone else’s? As soon as it turns September I am in the holiday spirit; I mean, it’s basically Christmas. September is for spices and sunset colors, gatherings, and delicious, hearty food! This fall 2016 may be the most exciting time ever for me. I am pregnant during the holiday season!! I couldn’t be happier. Pumpkin + Spices + Baby = OH YES!!! This is one of those special goodies. 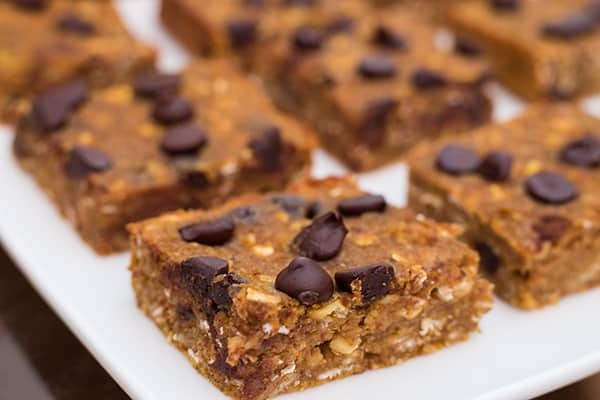 I am a huge fan of oat bars, and I LOVE making sweet treats that don’t use refined sugar. 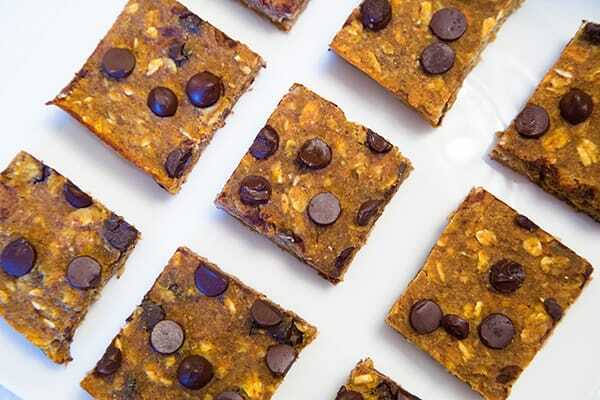 Now, don’t get me wrong, I love some sugar, but I find it especially thrilling when I can make a delicious treat that is satisfying, sweet, and truly healthy without the use of sugar. 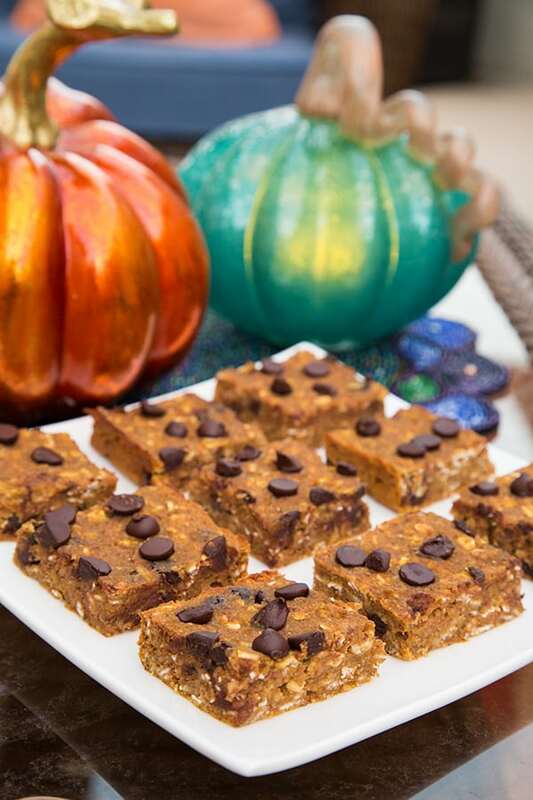 These pumpkin bars are perfect for the whole family. They are full of wholesome ingredients and are sweetened with dates and applesauce. I used date paste as the sweetener in this recipe. If you haven’t heard of date paste before, don’t be alarmed. Date paste is only dates blended with water! I make date paste once every couple weeks and store it in the refrigerator. I like to have date paste on hand because its easy to scoop out a tablespoon or two and add it to a smoothie, or spread a little on toast, OR in this case, scoop some into a bar recipe without having to pull out your blender! Try it, I think you’ll find it really handy. If you don’t have any date paste whipped up, just puree your pumpkin + 8 medjool dates + applesauce in the blender and then add it to this recipe. You can also use date sugar, which is just dehydrated dates in a sugar-like form. My mom likes this recipe with a little less chocolate chips and with walnuts added instead. Feel free to experiment! What other fall recipes would you like to see? Let me know in the comments below!